Peak Energy: Saint Jerome, keeping it real. I saw a reference to oil expert Craig Smith in Richard Daughty's latest article, in regards to rising oil prices. 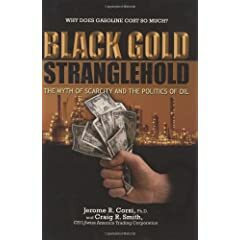 I took a look at the abstract for his upcoming book, Black Gold Stranglehold. Good heavens. Saint Jerome Corsi, paid liar and all around greaseball has found a sustainable, non-finite source of oil amongst the seminal soaked pages of Thomas Gold's masterwork? Well, knock me over with a feather. Apparently, in upside down world, Thomas Gold DID impregnate science. This nonsense is driven by the same cabal of Corporate - Statist think tanks which might try to sell property in Alaska -- (It is warm there now! Global Warming is a Boon!) -- without mentioning the swarms of ravenous bugs, buckled roads, and sinkholes. Were it to stop at gooey re-hashing of Thomas Gold's theory, this book would be silly enough. Saint Jerome is not one to be deterred -- he cranks out books faster than some people use toilet paper. Atomic Iran, anyone? (Queue spooky atomic music.) He excoriates those who endorse conservation -- which makes PERFECT sense if you live in upside down world, wherein the oceans are not acidic from carbon uptake, and the oil bubbles afresh out of the ground, in the magical quantity of 84 million barrels at present, and (est.) 110 barrels a day in 2020. Corsi also notes there are untapped reserves, which is true. Stack these reserves up end to end and they might run the U.S. for a few years, if extraction isn't too expensive. (The California Coast, ANWR, etc.) Is that the answer? Three more years of burnin' oil, and then "expensive" conservation? So what, Jerome? Expensive, for our civilization, is allowing fools such as Saint Jerome to ramble unchecked. unfreakingbelieveable. *sigh* we really do have a long way to go don't we? good catch. Peak oil has just been swift-boated and rather-gated all at once. This guy will be on all the right-wing radio stations, and the ditto-heads will join in. Time for all of us to concede the vote, hand in our resignations, and go home and sulk. We have no chance at winning this one. This is one fight with reality those cranks will lose eventually (thereby causing their followers much mental and financial anguish). I think so too -- but to the extent that this a concerted effort to align the world with neo-con talking points, it must be fiercely resisted. Perhaps they believe in nothing. I heard Spew Spewitt say that refinancing your house will more than make up what you lose in higher gas prices. Of course, it was in the context of a commercial spot.